Size of Male: 75-86 lbs.,23.5-27.5 in. Size of Female: 64-75 lbs., 22.5-25.5 in. The Spinone Italiano, or Italian Pointer, is an all-purpose gun dog from Italy. They are excellent family dogs, sociable and docile. At work they are vigorous, robust and very efficient dogs. They are slow-footed dogs, suitable for hunting in difficult terrain. Their wiry, dense coat provides protection in thick cover. They are loyal, friendly, alert dogs. Today, the Spinone is still used for hunting but they also make good assistance dogs and very good family dogs. The Spinone is easy going and affectionate and they love children. 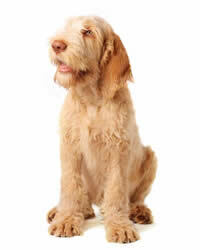 The Spinone Italiano was developed in the Piedmont area of Italy. They are likely a very old breed of hunting dog. They probably descended from the Spanish Pointer, a coarse-haired setter such as the Russian Setter and perhaps some of the continental pointing breeds. The Spinone nearly became extinct during World War II. They were brought back by crossing with some other wirehaired hunting breeds such as the Boulet, the Wirehaired Pointing Griffon and the German Wirehaired Pointer. The Spinone Italiano was recognized by the AKC in 2000. The Spinone is a very gentle, good-natured dog that seeks to please its owner. They have a long history of working closely with their masters in the field and they can be very sensitive and intuitive. Spinoni are very easy going dogs. They are more relaxed and laid back than some sporting breeds. These dogs do need exercise and enjoy a good run and romp, however. These Italian Pointers make excellent family dogs and love children. They also get along well with other family pets. They are adequate watchdogs but they are not good guard dogs at all as they are usually welcoming and friendly to strangers. Living Environment – Although they are large dogs, Spinoni like to be close to their people. They enjoy being wherever their owners are, including indoors. They generally have good house manners, but they do like to have a yard of their own. They have been observed to jump out of a yard or tunnel under a fence, so make sure your yard is secure. Grooming – Grooming for this dog breed is not difficult. They do need to have dead coat stripped out occasionally. Otherwise they should be brushed weekly and bathed occasionally. Diet & Exercise – Dietary needs for this breed is normal. These dogs have moderate to high exercise needs outside though they are usually very relaxed indoors. They don’t usually have the high energy levels that many other sporting breeds have but they do need regular daily exercise. Jogging with your dog is one way to meet their energy requirements. Health – In the health department, this dog breed is prone to canine hip dysplasia, bloating and Cerebellar Ataxia. If you are interested in this breed, you should talk to a breeder about possible dog health problems. In the dog training department, the Spinone is a very intelligent dog and they have a strong desire to please their owner. However, like some other sporting breeds, there are times when they will decide to ignore you or pretend that they don’t hear you. You may tell your Spinone to do something and he will look at you with a totally innocent face, as though he has no idea that you just spoke to him. Be persistent but kind with your training. Spinoni are sweet, sensitive dogs and they do best with positive dog training methods (praise, rewards).